Resolution 18.1: Demand reduction strategies to combat illegal trade in CITES-listed species. ADI SUPPORTS this resolution as it recommends a number of actions by Parties to study demand for illegal wildlife products and to develop and implement a full suite of strategies to reduce that demand. Poaching and illegal trade are decimating certain wildlife populations. Holistic, effective strategies are much needed to address the entire trade chain, including protecting wildlife populations in their habitat, curbing poaching, banning illegally traded wildlife at points of export and import, and reducing market demand. Evidence shows that government policies and law-enforcement efforts, including anti-corruption campaigns, stricter measures on trade regulation within countries, increased enforcement, and legal and prosecution measures can all contribute to combat wildlife trafficking. The resolution pushes for research to be conducted to provide a solid scientific basis for identifying and prioritising targets and to gather data to enable the design and development of intervention programs. Resolution 39.1: Hunting Trophies Of Species Listed In Appendix I Or II. ADI SUPPORTS the aims of this resolution because hunting trophies of species listed in Appendix I or II of the Convention are traded in significant numbers. Such exports consist mainly of trophies of animals taken from the wild but, in some instances, correspond to animals bred in captivity. The sustainability of removing animals from populations subject to trophy hunting is highly questionable. In particular, concerns have been raised about the trade in hunting trophies of species listed in Appendix I or II, especially where trophies account for a large portion of the overall trade. It is proposed that all Appendix I and II animals should also be subject to conditions which would allow better controls of the sustainable and legal origin of those specimens. Such measures should be accompanied by a closer dialogue and coordination between exporting and importing countries to ensure the proper implementation of the rules. The resolution by the EU should be strengthened in order to ensure a sound scientific basis for, and transparency in, the permitting process. Resolution 57.2: Closure Of Domestic Markets For Elephant Ivory. Party: Angola, Burkina Faso, Central African Republic, Chad, Côte d’Ivoire, Ethiopia, Gabon, Kenya, Niger and Senegal. ADI SUPPORTS this resolution due to the illegal killing of elephants and trade in their ivory being a major problem across much of Africa. It threatens the survival of many populations of both savannah and forest elephants, including those that were previously thought secure, and damage the natural balance of African forest and savannah ecosystems. The poaching of elephants and trafficking in ivory harms the sustainable economic development of local communities. The trade is facilitated by international criminal networks, is fuelled by and aids corruption, undermines the rule of law and security, and can even provide funding to those involved with militia and terrorist activities. Legal and illegal ivory sales increase the risk to elephant populations and local communities, since local ivory markets create a significant opportunity for the laundering of illegal ivory under the guise of legality. The resolution calls for the closure of domestic ivory markets in range, transit, and consumer countries, because of this. Such measures would simplify enforcement and send a clear message in the fight to protect African elephants from extinction. China, Hong Kong, SAR, United States, France and Angola have announced action to close domestic legal ivory markets. 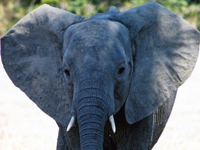 Resolution 57.4: Trade In Live Elephants: Proposed Revision Of Resolution Conf. 10.10 (Rev. Cop16) On Trade In Live Elephants. Party: Burkina Faso, Central African Republic, Chad, Kenya, Mali, Niger and Senegal. ADI SUPPORTS this resolution as there are well-documented harmful effects resulting from the capture of young African elephants for ex situ purposes. Transferring wild populations to captivity under the guise of conservation defies current best practices and “profoundly impairs” the individuals’ survivability, and threatens that of the herd left behind. 3 These effects include the trauma experienced when young are removed from their mothers and family groups and confined in unnatural enclosures, as well as high rates of mortality, injury and disease in captivity. Between 2005 and 2014, 70 live wild caught African elephants were exported from African range States for purposes other than reintroduction or introduction into the wild for conservation including trade to zoos for circuses, education and commercial use. According to CITES, the term ‘appropriate and acceptable destinations’ is defined “to mean destinations where the Scientific Authority of the State of import is satisfied that the proposed recipient of a living specimen is suitably equipped to house and care for it.” There is a strong need to re-evaluate this definition; language regarding trade in live elephants should restrict the trade of those taken from the wild, only for transfers to natural habitats for conservation purposes, preventing elephants from being taken from the wild into captivity. According to CITES, the term ‘appropriate and acceptable destinations’ is defined “to mean destinations where the Scientific Authority of the State of import is satisfied that the proposed recipient of a living specimen is suitably equipped to house and care for it.” There is a strong need to re-evaluate this definition; language regarding trade in live elephants should restrict the trade of those taken from the wild, only for transfers to natural habitats for conservation purposes, preventing elephants from being taken from the wild and into captivity. There is support in most of the African elephant range States for restricting trade in live African elephants taken from the wild only for in situ conservation purposes, preferably involving transfer of entire family groups.